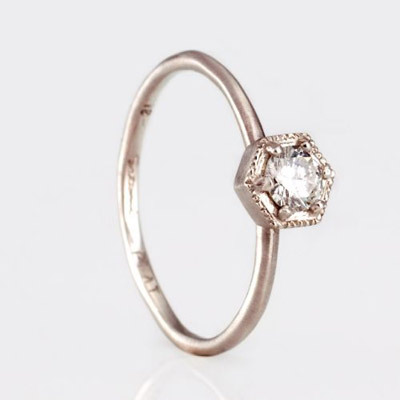 We can order most anything in her size, including the Satomi hex ring. These guys are on sale! We can resize them for her. p.s. 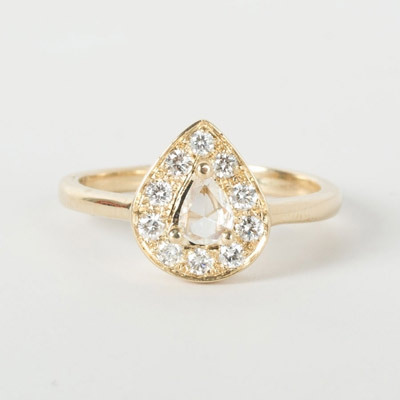 If you do fall in love with a ring from somewhere other than Catbird (WHYYYYYYYEEEE? but anyway) don't be afraid to ask about special orders/resizing. Nordstrom's will size the ring for free, for life! I got my ring at a size 8. It only took 2 weeks. And if I lose weight, they will resize the ring again, for free! Its part of Nordstrom's customer service plan. Its great! I would suggest trying the ring(s) or a very similar style on before making any committments. I've also got a big finger (size 8.25) and found that a lot of daintier rings (like the Hex ring at Catbird) made my finger look gigantic. Agreed. Try everything on as you can. I wear a 7.5, but my fingers are a bit 'meaty' looking. I LOVED the Hex ring in theory, not so much in practice. ah thanks for the advice i have fat fingers too and thats one of the reasons i dont wear rings so finding an engagement ring is hell. i will forward this post. can we also talk about the 'not to be fucked with' line in the promise-ring section at anna sheffield's site? 'cause those are bloody great. can we talk about the greatness of anna sheffield? well done you. new potential for wedding ring in there. maybe look for a three-stone ring? so flattering on the hand, and more sparkles! they can be very delicate too, if you find the right shape. So true. I found that shapes that tapered out from the middle were much more flattering on my finger than solitaire-types shapes. i don't understand why anyone would write-in about this. firstly, 8.5 is not THAT large of a size. most rings come around 5-9 standard. 10+ would be "fat" sausage fingers. 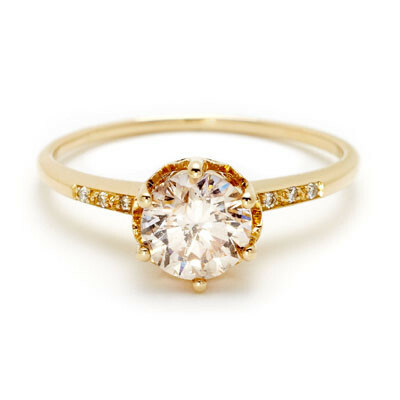 second, just about every engagement ring ever will be sized to you- if not made to order... ESPECIALLY if your spending upwards of 4k. send a frigging email to the designer you like. You should shop with the mindset that resizing is definitely going to need to happen. O.o 8.5 is fat? I am a plus-sized person with gigantor hands (my hands are the same size/slightly larger than my 6'3" fiance's) and my engagement ring is a 12.5. All of the catbird/similar styles looked TOO delicate on my gigantic hands (I take a men's large in glove sizes, if this in any way impresses just HOW large my hands are), so I wound up gathering together vintage styles that I liked and working with a local custom jewelry designer. My fiance gave her his budget and we picked out an antique diamond and made a custom, vintage-inspired platinum setting (I have metal allergies, so platinum was the safest choice). She's also designing our wedding bands so that my wedding band coordinates perfectly with my engagement ring. My advice is that if you have an ACTUALLY large finger/hand, find a local artisan who will make something suited to you. If I had just had another ring sized up, the proportions of the ring would look all weird because I have enormous hands/fingers. As great as it is to look at stuff online, there really is no replacement for seeing things in person and being able to see how things look on you. I would totally look for a local jeweler. You can buy the stone separately and bring it to the jeweler or buy from them. We bought a laboratory-diamond on the internet and took it to a friend's mom that does jewelry design on the side. She also helped us create our wedding rings and mine fits around my engagement ring perfectly. I had the opposite problem and it was nice to find someone that could understand. (I started with a 3.5 and sized it down to a 3.25 when we bought my wedding ring.) Most rings start in a 5 and don't look right when you size them down. my fiance got this ring from brilliant earth and I absolutely love it. The company was great to work with, and the diamond is ethical, which was important to me. Satomi is amazing, and was happy to customize my version of the hexagon ring, which I love, BTW (my chubby fingers and all!). If you are in NYC, you should visit her studio, as she has tons of different sizes and styles there. Good luck! Late to the game here, as always. I have an 8.5 finger as well. When we shopped in store, the ladies told me that display rings are almost always a size 5 and they resize for pretty much everyone. It was a bit difficult to visualize wearing a ring when I couldn't slip it past the top 1/3 of my finger, otherwise my 8.5 finger was treated no differently than any other. 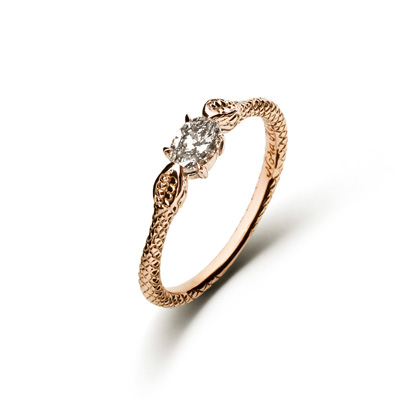 I ended up finding an old ring on ebay, *remarkably* similar to the Anna Sheffield Bea Ring pictured above. The emerald cut is pretty flattering to my lousy stubby hands. I found that most places advised old/antique rings not be sized up or down more than ~2 sizes, because it can affect the setting. Otherwise, it's the easiest thing in the world. Find a ring you like, pay $60 to get resized. Done. I have a size 11 finger. We worked with an etsy seller to have a custom ring made and they had no problem making it in my size. Because I got a gemstone, we got a rather large stone for our money. Nodeform on etsy. Amazing work. 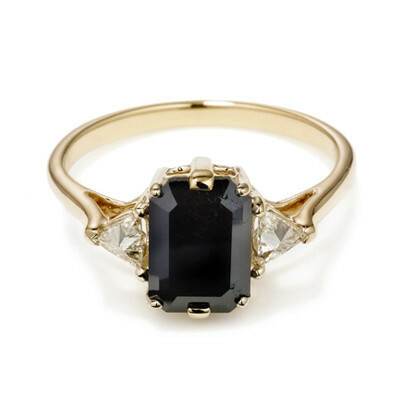 I love Anna Sheffield's rings and tried several on - they are MUCH daintier in real life than they seem on the screen. I wear a 5.5 and I thought they looked too small on my fingers. I have sort of short fingers though, and I am planning on an oval or pear-shaped ring, which tends to have an elongating effect. Something you might think about if you have stockier digits. I like the third custom jewelry style. It was simple yet very elegant. We haven't had our rings yet but if we do, this is exactly what I wanted. Satomi was super quick to customize my ring, (not for size, but for making something that was not in stock anymore and adding texture). She was amazing to work with and I HIGHLY recommend her!